Menthogel- a gel solution for (Arch,Big Toe,Bunion,High Heel Protectors),Menthogel , a stretchable solution with soft gel pad to relieve pressure on your feet. This product is designed for people with flat feet,bunions or pain in Arch, big toe, or by wearing high heels. Menthogel , a stretchable solution with soft gel pad to relieve pressure on your feet. This product is designed for people with flat feet,bunions or pain in Arch, big toe, or by wearing high heels. A scented daily wear to freshen up your feet and helps to absorb impact to relieve you of any pain you have throughout the day. Pain free gel solutions for weeks. Very Easy to apply: A Self stick gel cushion works with all types of shoes and heels. The scented gel cushions will keep your feet pain free and refreshed day in day out. Painful bunions are very hard to handle and we look for solutions everyday. The gel bunion protectors are cost effective and refreshing for your feet. 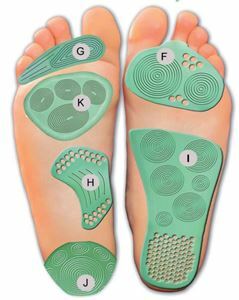 They help to keep your feet pain free. Bunion protectors come in a set of 2. A bunionette is a deformed bone which sticks out on the outside of your 5th toe finger. In the beginning the problem is small but can turn out to be very painful. Surgery is the last option and before that we have bunionette splints and shoes to help you recover from this problem.Bunionette gel cushion relieve the pain on your little toe finger the fifth toe. Quality product dispensed from a canadian brand. I simply love my bunion protectors. Product arrived in no time and the nice minty feel to them makes them even better. I like the fact that all the menthogel products are placed on one page which makes it easier for you to select your product rather than searching for them separately.